Many applications require entering a number from a button and then the device counts that number down. If it is a 2 digit number it can be stored in a single register. If it is larger a register pair can be used. When a button is pressed the number associated with that number is put in the LSN of the register. The MSN is usually 0. In other words, if 5 is pressed on a microwave oven or a calculator, the number 05 is placed in a register of the microcomputer. If the sequence 5, 4, 3 and 2 were pressed each number would be stored in a separate register. 5 would be consider the most significant digit. When the start button is pressed, the microcomputer consoldates the 5 and the 4 into a single register, and the 3 and the 2 into a single register. The 5 in its register is shifted to the left by 4 bits placing it in the MSN of the register. The 5 and 4 can now be placed in a single register. Since one register has 50 and the other is 04, they can be scored together to produce 54 in a single register. This procedure is repeated for the 3 and the 2. If 2 ASCII numbers were received via the com port on a pc, it is not as simple as above. 5 is 35h and 4 is 34h. The 3 must be stripped from the MSN, before the 5 is rotated to the MSN position and for 4 the 3 has to be stripped from the MSN position. To do this of is ended with the 2 ASCII numbers. This makes the MSN 0 and keeps the LSN as it was. 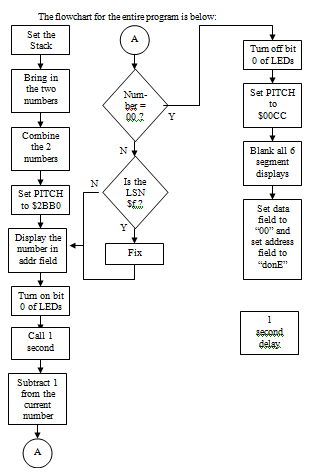 Write a program from the flowchart in the above. Refer to previous experiments to write the program. Test each stage after you write it, to make sure that it works properly.